I have, just been busy. Has it really been over five years already? Hi again, been a while. He likes to trip over things too. Well if I do things right, I'll say the out come might be hilarious. Well no wonder why I didn't get it, considering I've never played Animal Crossing in my life. I remember Kisame's ultimate...it was too powerful >_< I'm only on chapter 4 though. I just started playing Ninja Storm 3, it's so good~! I'm not a nerd unless I'm wearing nerdy glasses, which I don't have at the moment. I had a rough day yesterday. Tomorrow isn't going to be pretty either. Yeah, I zonkied like I typically do. I've been doing alright so far. It'd probably go to one of the staff members. I don't know, actually. Yoshi is the first in line. How did you know Drifblim was one of my favorite Pokémon? Well, that's true at least. You're a lie, and I know me better than anyone. I've barely changed since the end of 8th Grade. But TurtwigX walks on TWO legs. Haha! What do you mean? I've totally always been this way. I'm going to Buy Persona 3 and 4 soon..
Is this your 1st time watching the series? What anime were you watching? Am not :I I'm just being myself. There a problem with me being Turt? Yes, you totally do. That or we simply clash too much for us to totally agree on something. I think that might be it. Either way, that doesn't stimulate my mind enough to make me want to write unless something insane happened while I walked. Pfft, long and meaningful walks are too peaceful, they don't fill my brain with new ideas, it relaxes it to sleep. Also, I do not walk. Walking is gross. Oh darnit, you're still feeling fine. I'm not trying hard enough. I'm fine like always, but I'm looking for more inspirations to write. More than my usual "unusual shipping fanfic" inspirations because I have too many of those that I don't want to bring to life. Oh, did I make you feel bad? Mission accomplished. I have this voice in my head that just tells me to be rude to you for no reason at all. Oh well, hello Souly. Miss you? Oh of course I did, just like Edward misses being called short. But it's not like either of us left, I just choose to never speak to you. 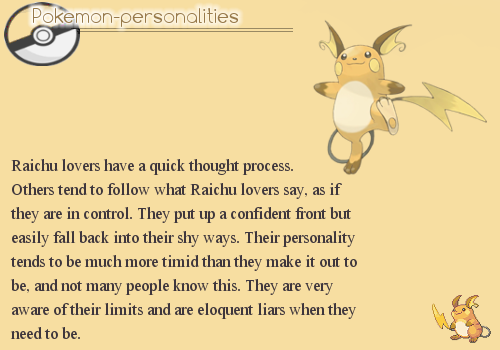 Hehe, looks like poor Raichu needs a hand. Or, paw. Glad to see some receptivity. I got a better idea, we put you in the freezer and 1000 years from now we will thaw you. It's time travel! Aw~ You're not the only one. Hey, I think Syra wants you. So you want me to rip your spine out? sometimes I feel that you show me all these feminine pictures of glaceon just to make me wish I had a girlfriend. Too bad I already have a Valentine. :3 I love this new Eeveelution.